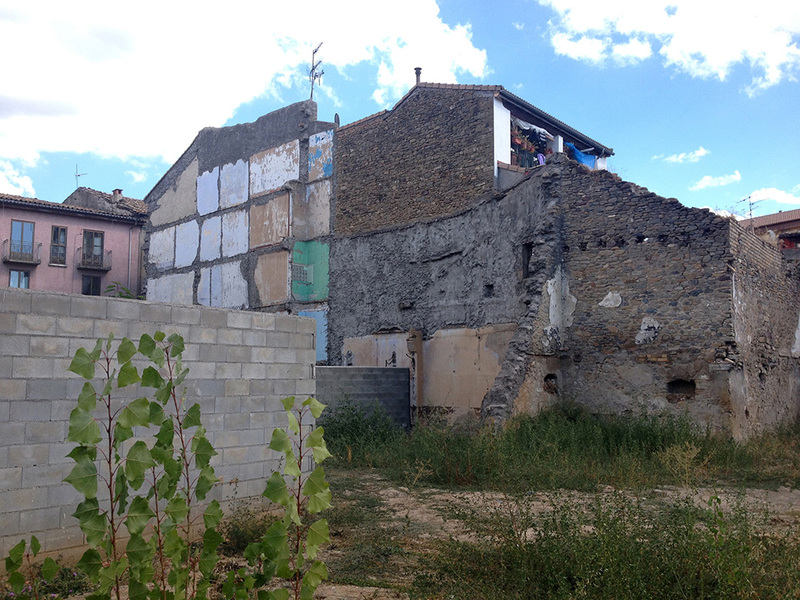 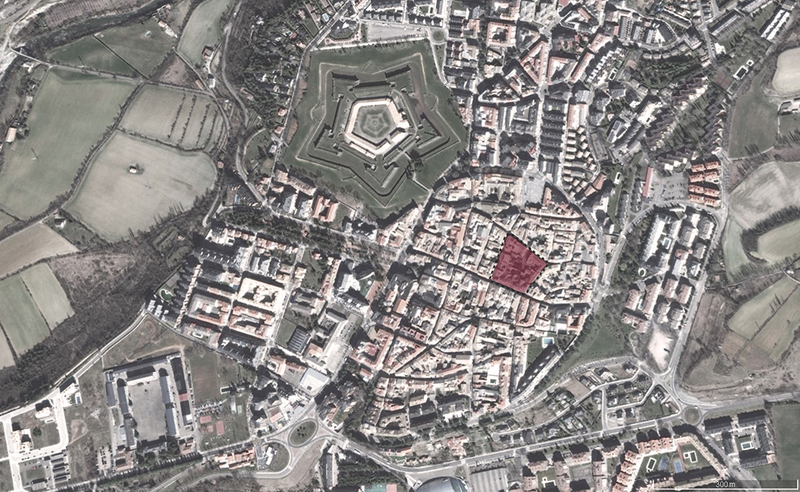 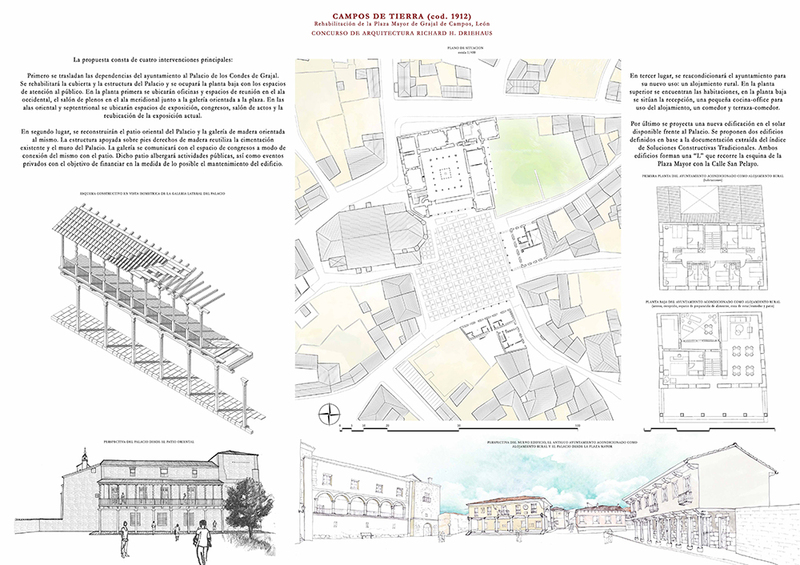 In Grajal de Campos the proposal called for restoring part of the buildings that had formed its plaza years ago but which are now partially in ruins, thus providing the city with homes and stores that it could rent at low prices to attract a new generation of settlers to the area. 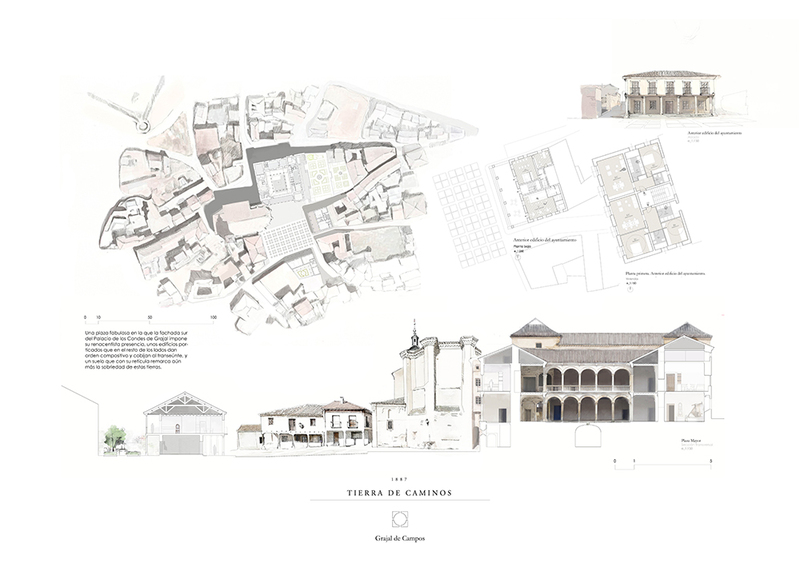 The proposal also called for restoring the Palace of the Counts of Grajal, which could house, among other uses, a hotel that could help towards the already mentioned goal. 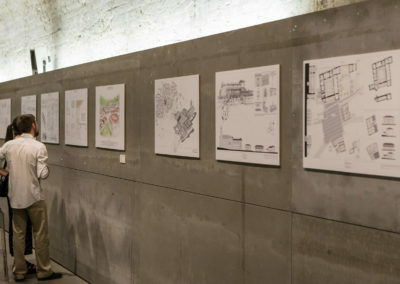 A total of 31 design proposals were received. 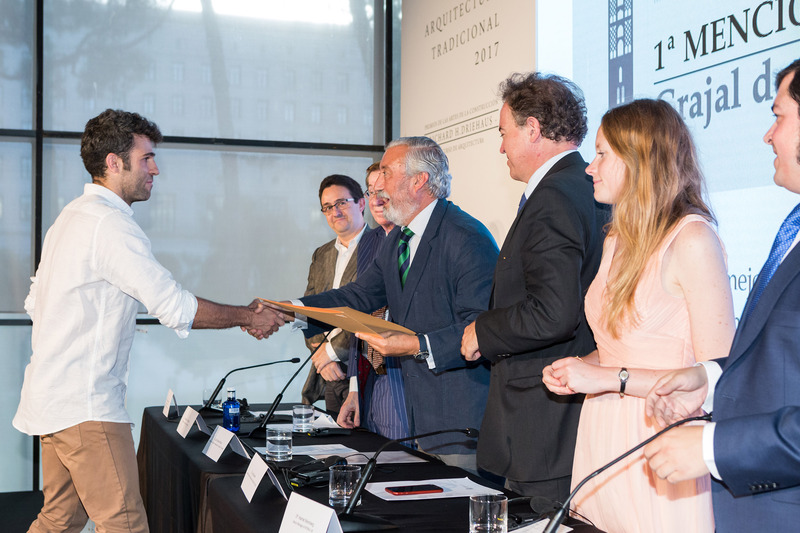 The jury selected a top prize from among them, awarding a €12,000 prize to the architects Imanol Iparraguirre Barbero and Aritz Díez Oronoz. 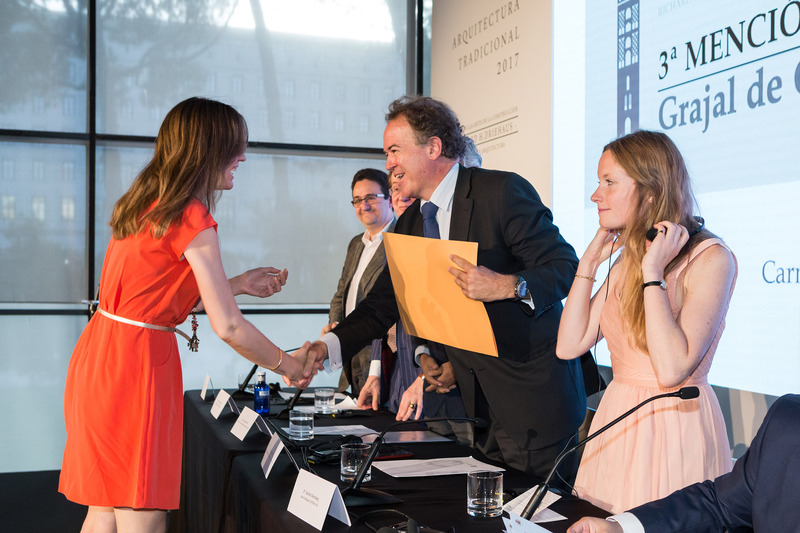 Three honourable mentions were also awarded for €2,000 each. 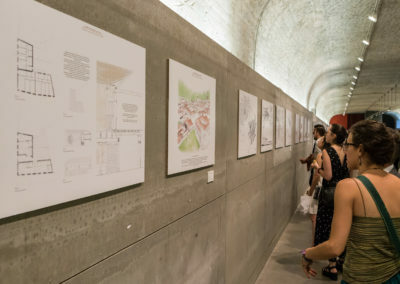 The project that was awarded first place and a €12,000 prize came from the Basque architects Imanol Iparraguirre Barbero and Aritz Díez Oronoz. 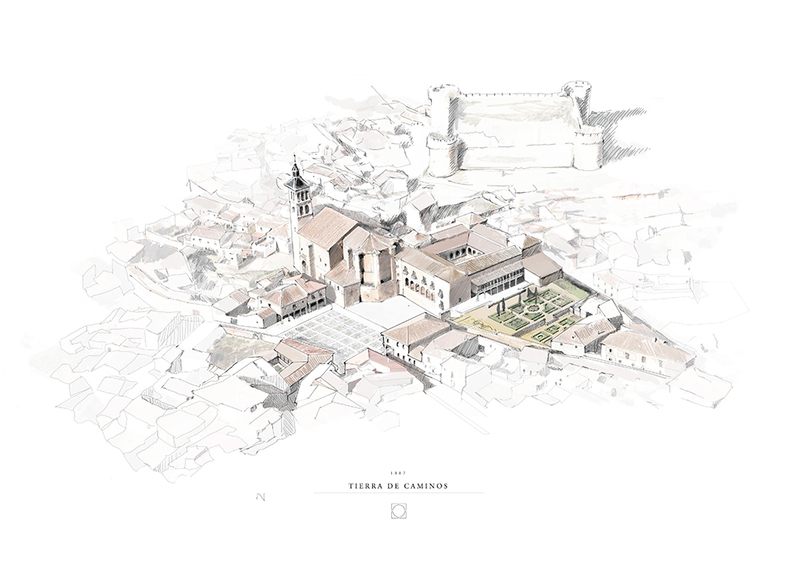 Their project, which is entitled “Lázaro” (Lazarus) seeks to give this town in León back the lost vitality of its main plaza. 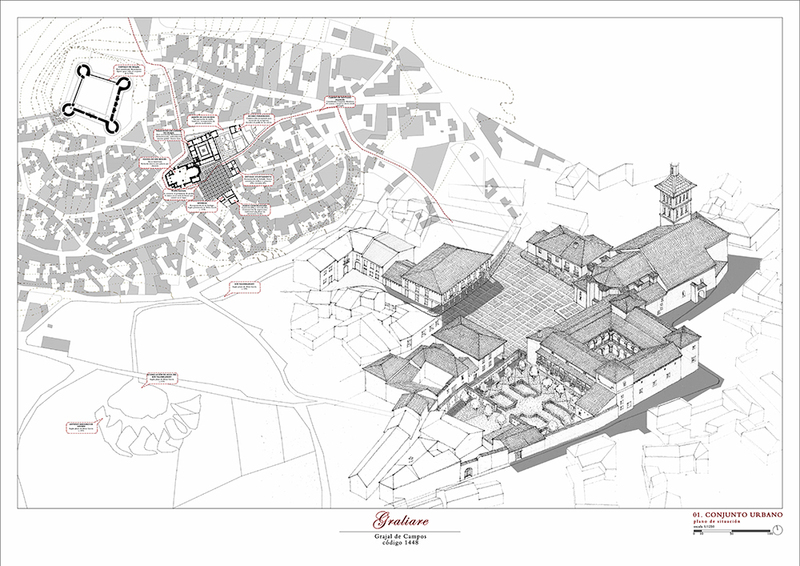 They are reconfiguring this space with new houses and stores, and rebuilding the old fountain that had always been a gathering point for locals. 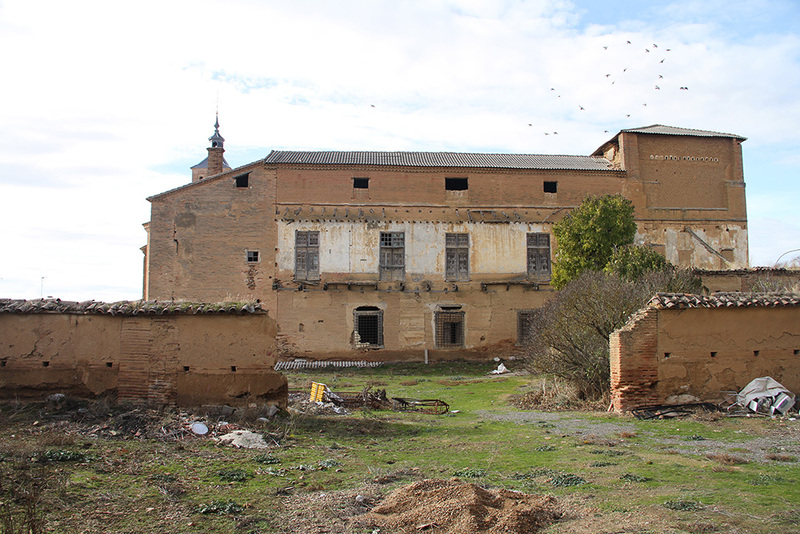 The palace is also recovering its image and its gardens, and its inside is being remodelled to house tourist lodging, along with other uses. 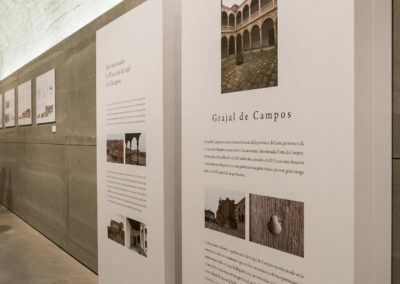 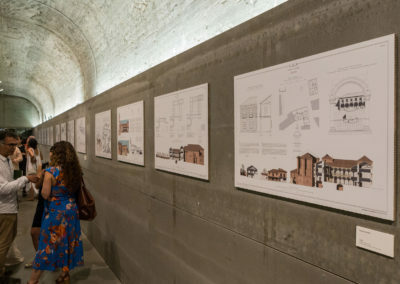 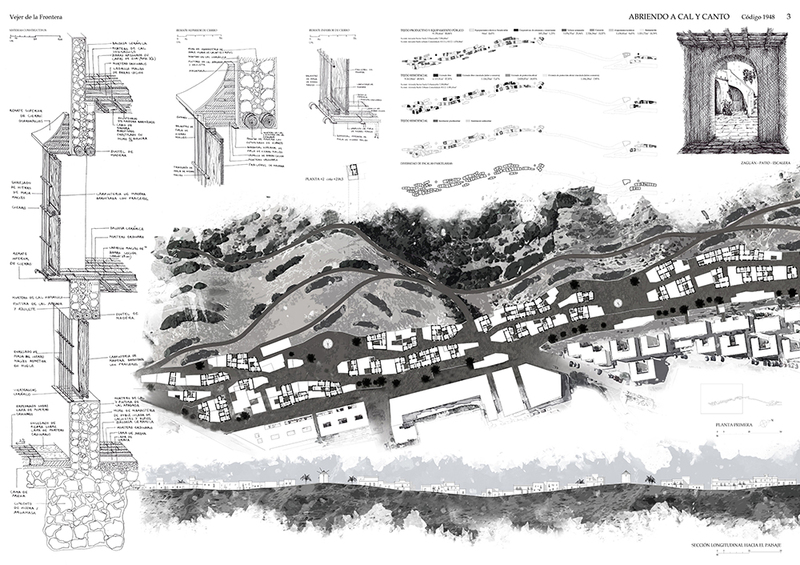 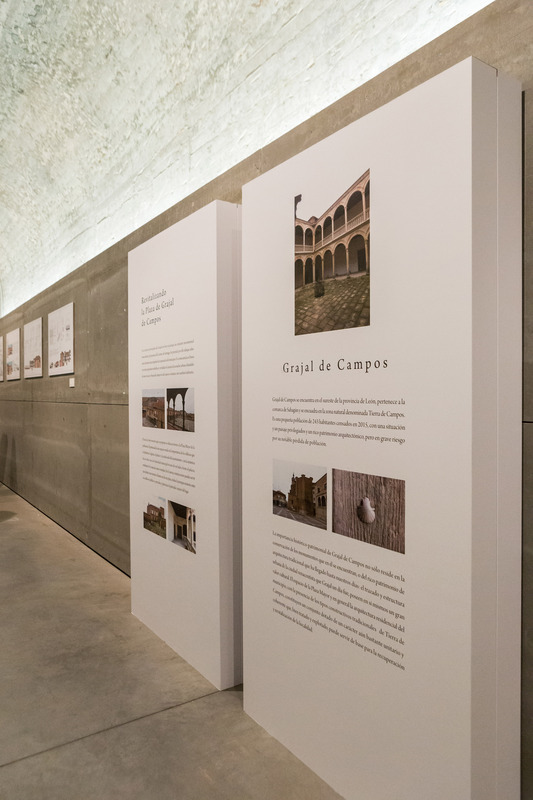 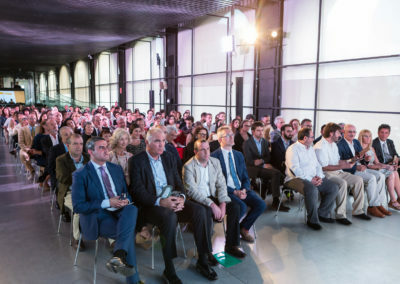 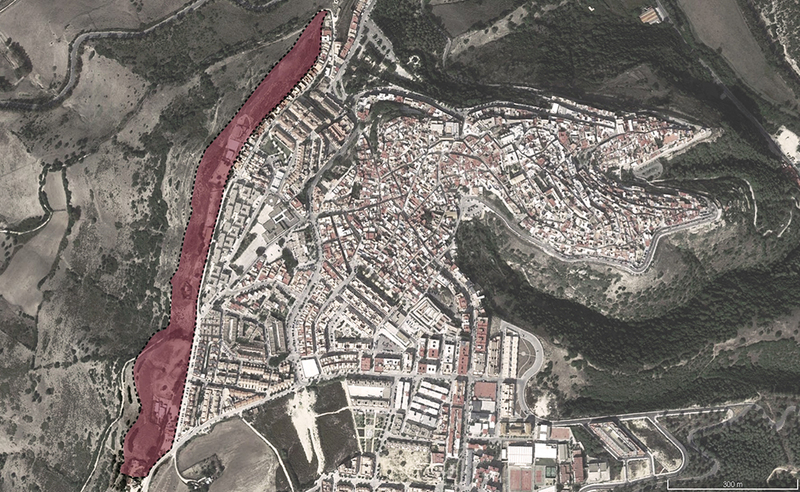 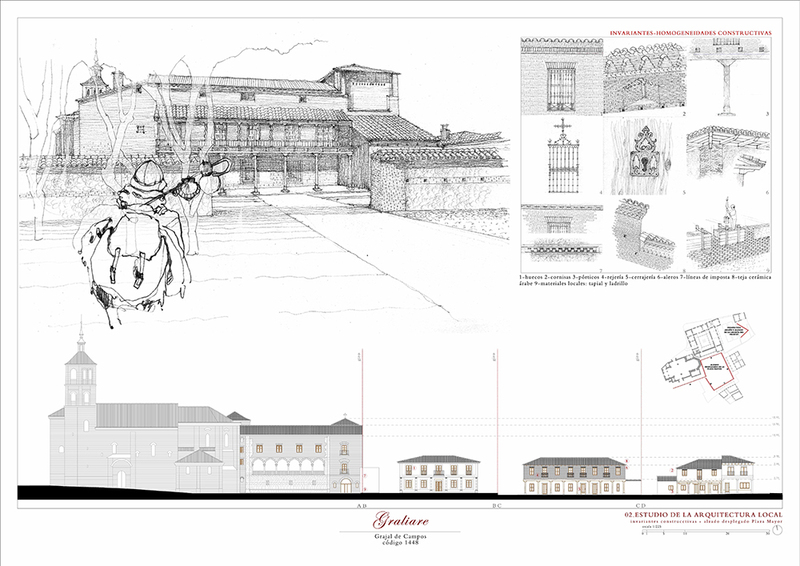 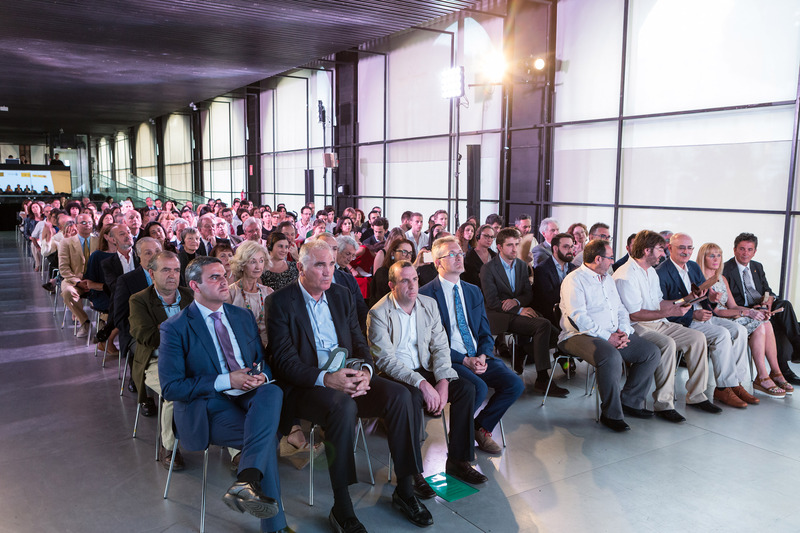 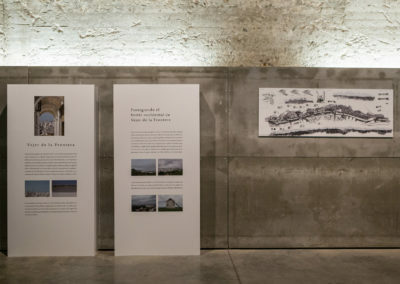 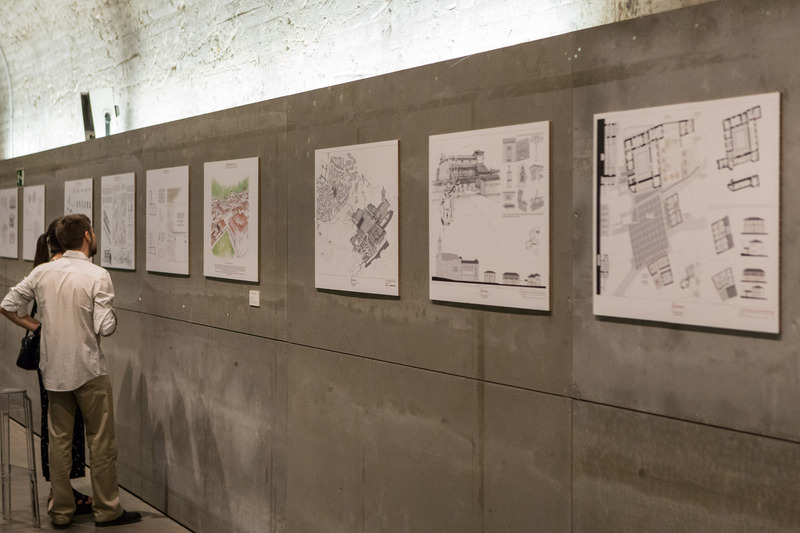 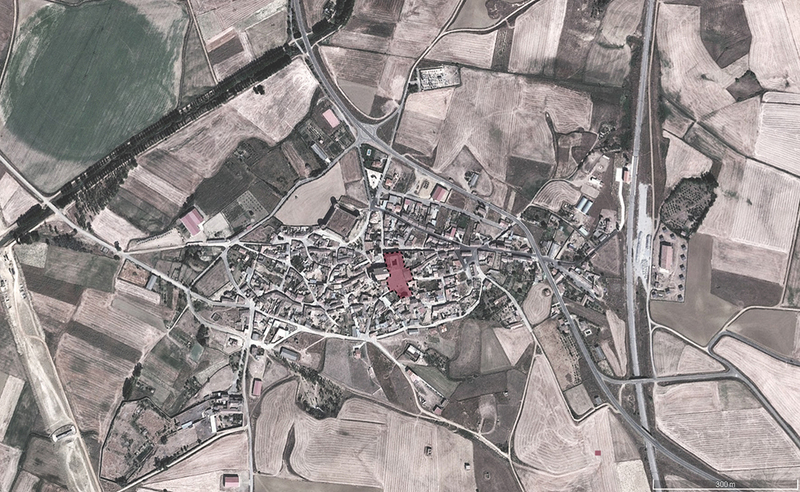 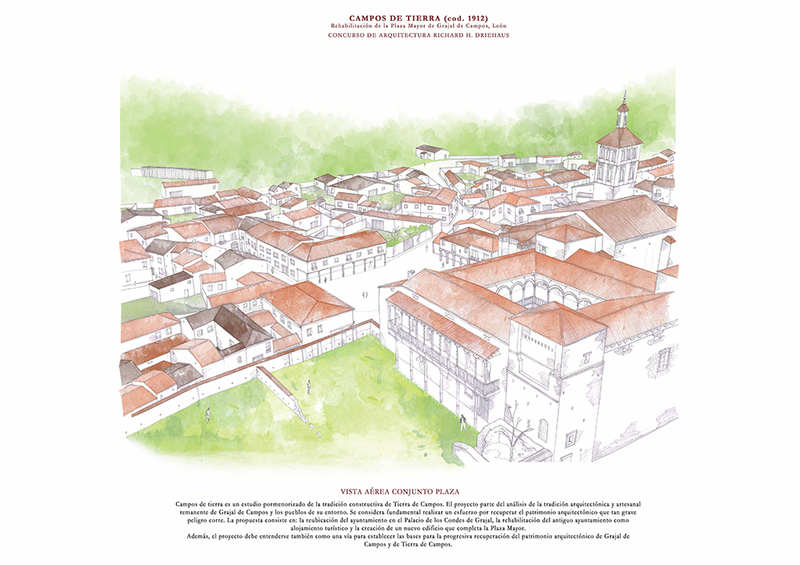 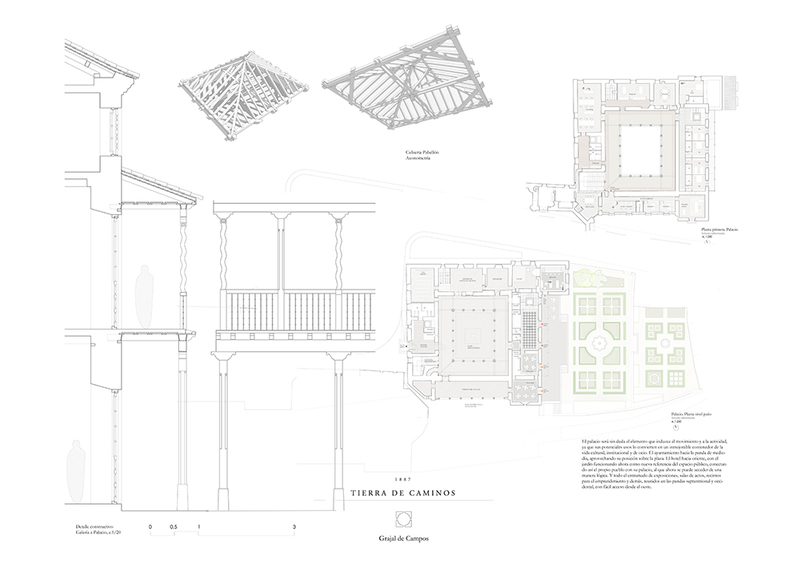 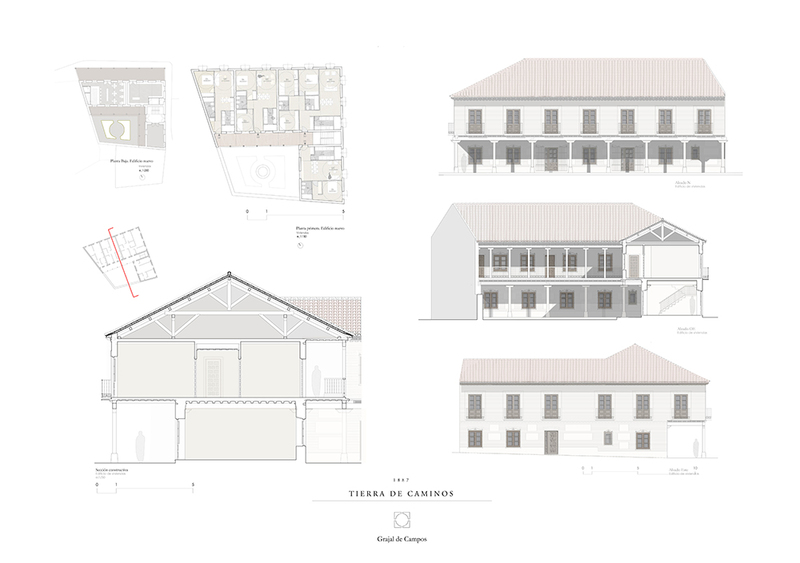 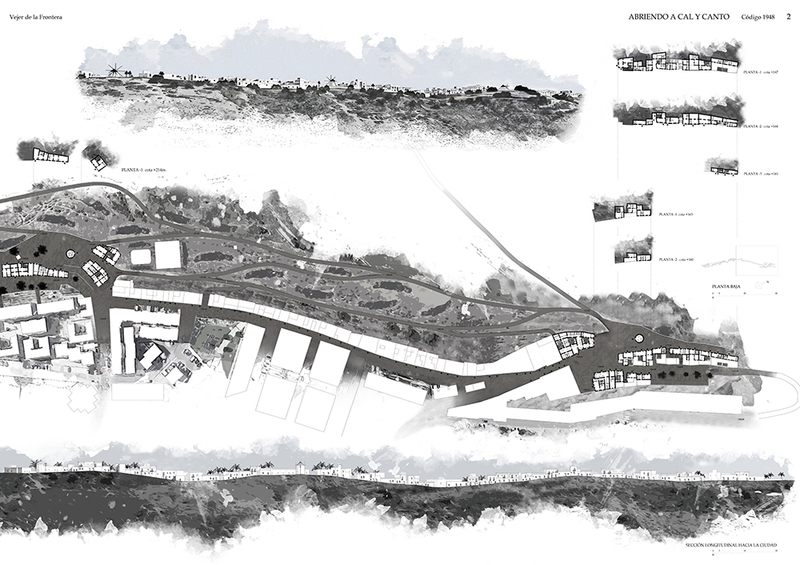 The jury praised the proposal’s respect for the site’s history and its choice of designs, construction techniques and local materials, which might generate more and better quality jobs in the town, thus empowering and strengthening Grajal de Campos’ unique identity. 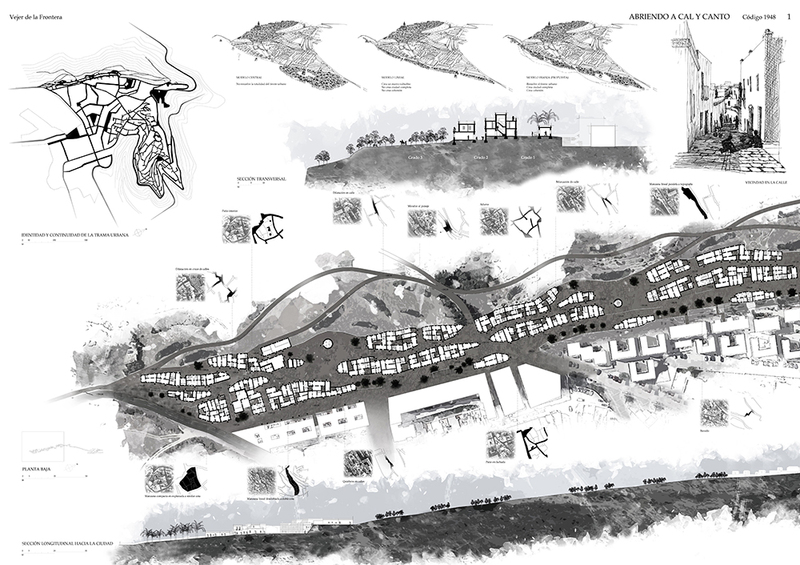 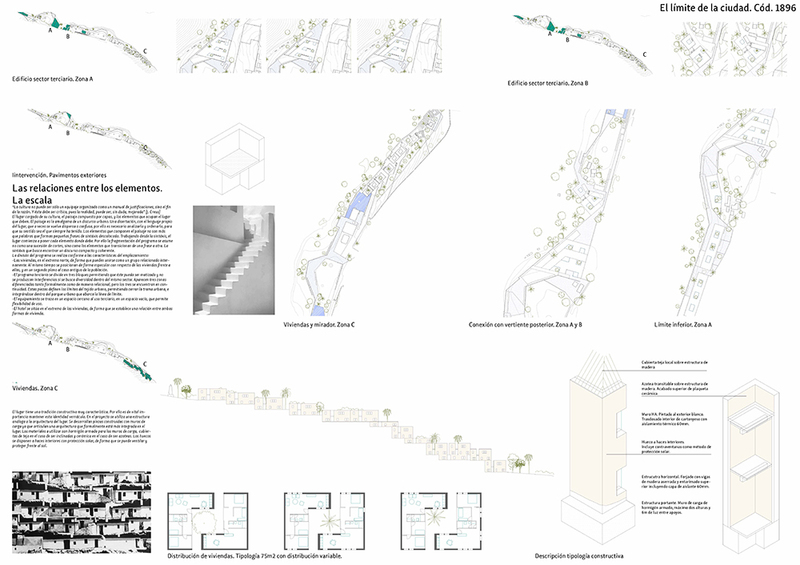 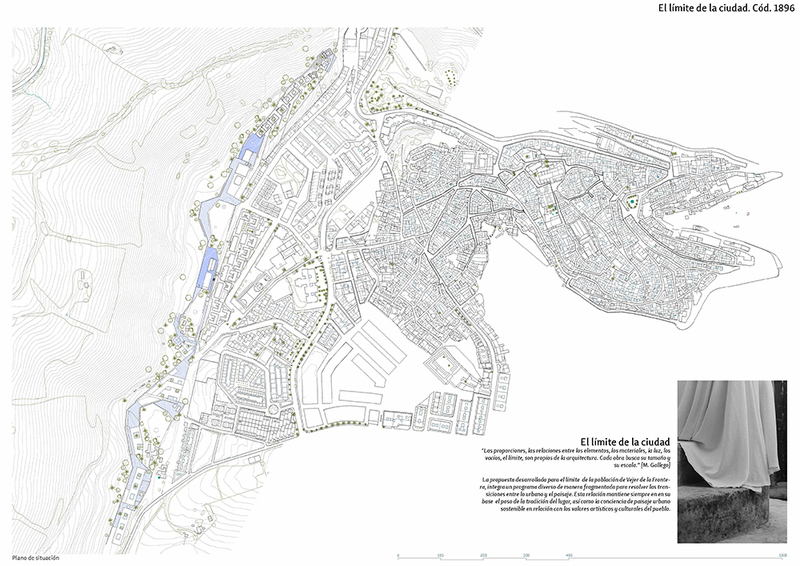 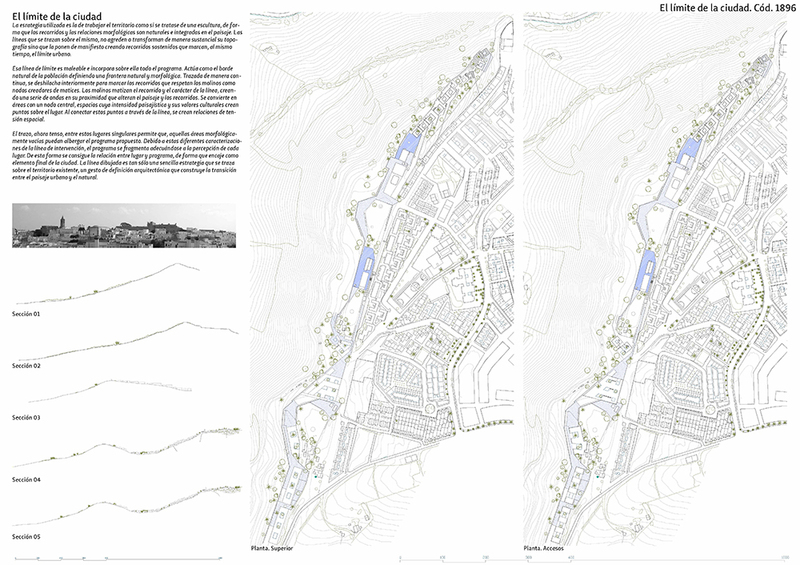 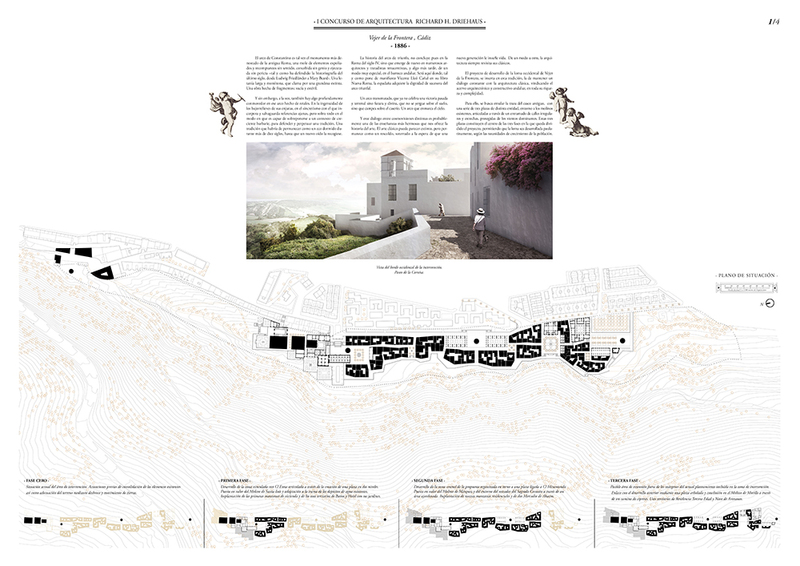 Because of the excellent quality of the other proposals that were submitted, the jury also decided to award three honourable mentions, with a prize of €2,000 each awarded to the proposals entitled “Graliare”, by the architects Xavier Espinós Bermejo, Estefanía Fernández-Cid Fernández-Viña, Lucía Espinós Bermejo and Rodrigo Toro Sánchez, a proposal that paid intense intention to getting back local construction jobs and to the economy that they would generate; “Campos de Tierra”, by the Wabi-Sabi studio (Laura Bacete Cebrián, Raúl Cubo Contreras, Alejandro Domínguez Rueda, Andrea Figueroa Chaves and Pablo Navas del Peral), who conducted an exhaustive analysis of the local architecture to apply it in their design proposal; and “Tierra de Caminos” (Land of Routes), by a team of architects consisting of Javier de Mingo and Carmen Bueno, with a meticulous design that emphasised the local identity. 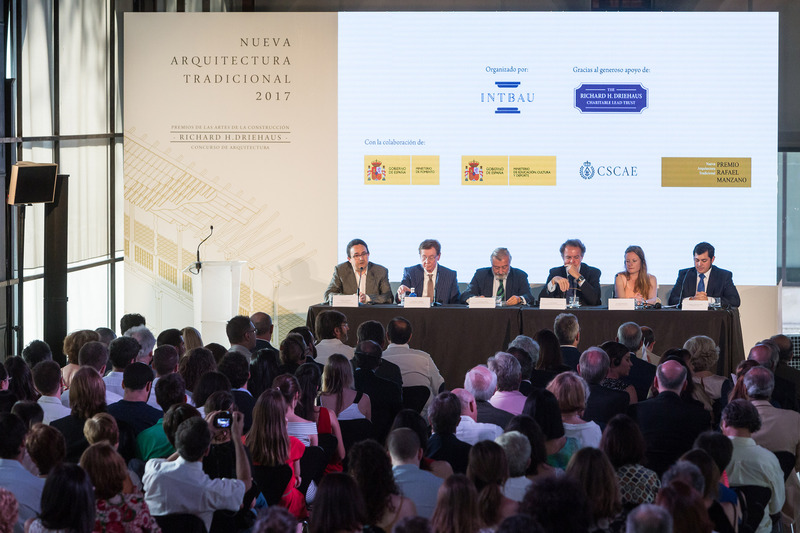 In the case of Jaca, the proposal called for transforming the inside of one of the blocks in its historic district to create a new central plaza for the city. 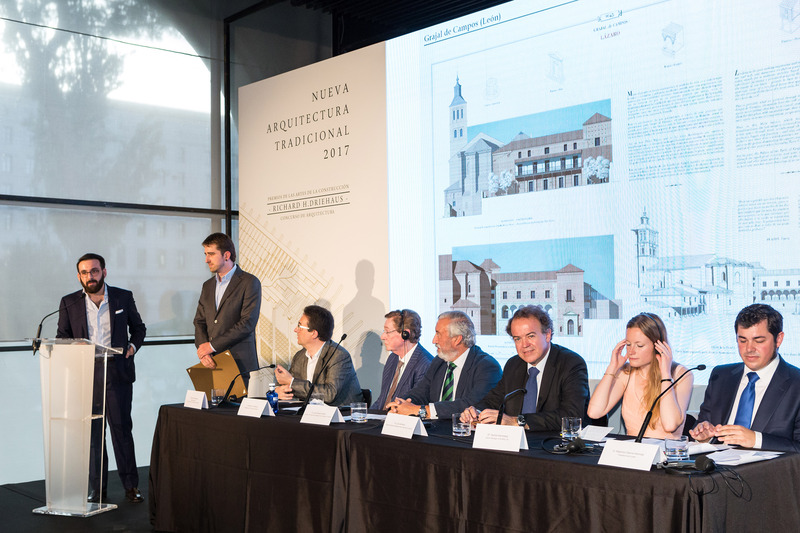 A total of 23 proposals were received, but since none of them met all of the criteria set for the competition, the jury decided not to award a prize for this site. 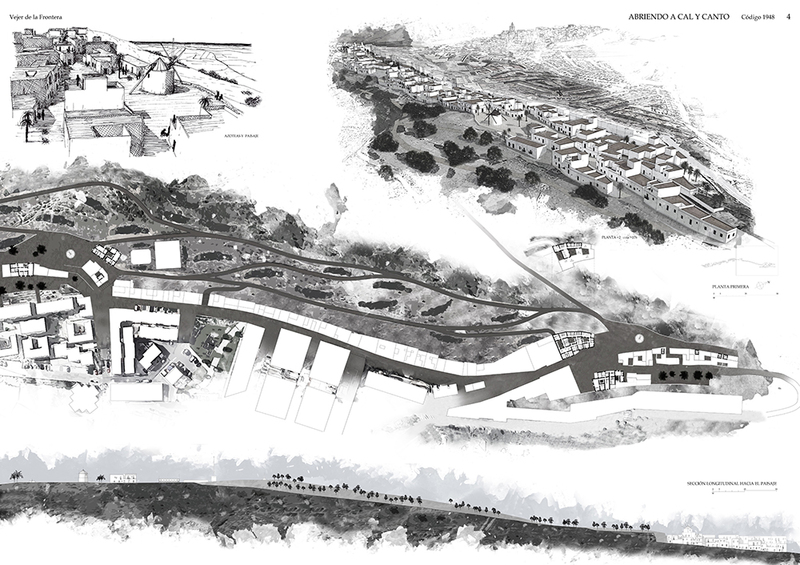 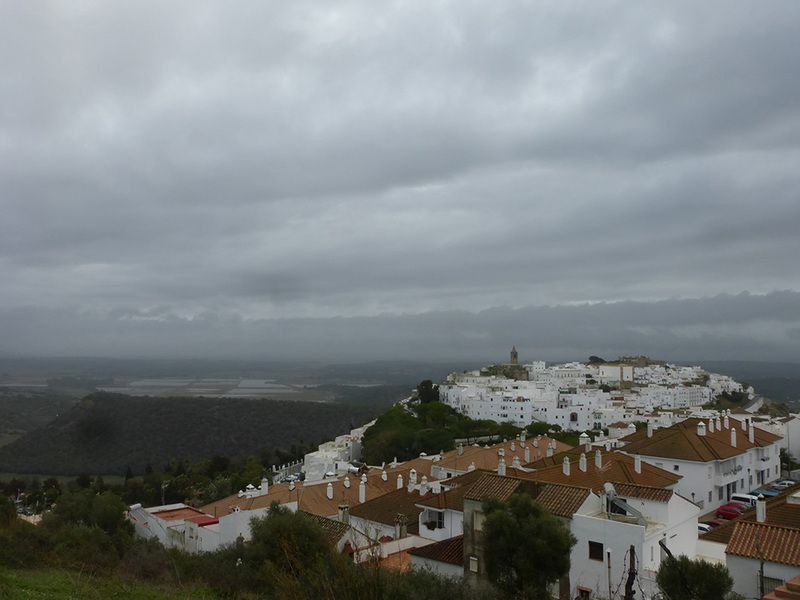 The goal of the proposal for Vejer de la Frontera was to find a solution that would match the local landscape for the new urban design development envisaged for the city’s western city edge: a hill topped by a series of windmills representing a major visual landmark due to their forming the skyline of the city when arriving from Cádiz. 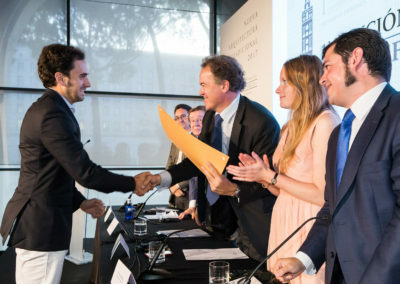 A total of 20 proposals were received. 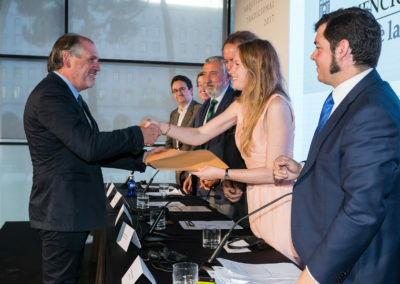 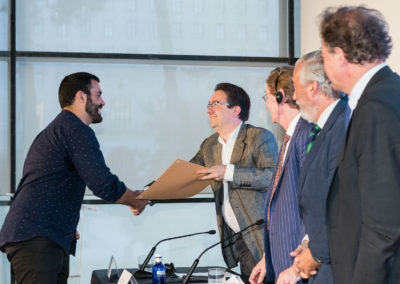 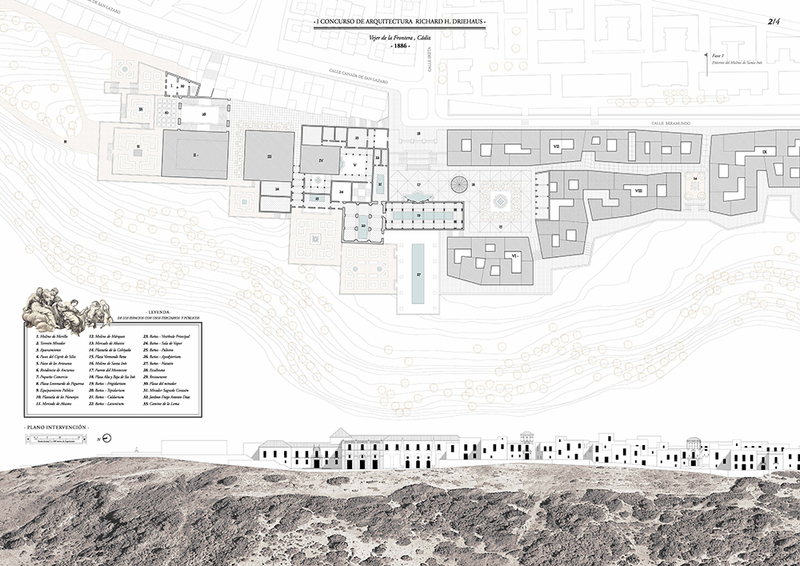 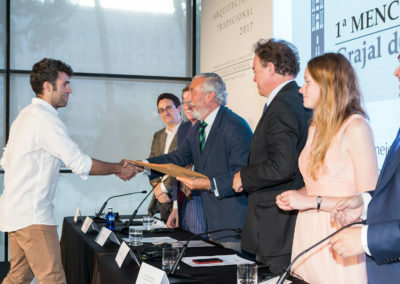 The proposal that the jury decided to award with first prize and €12,000 came from an architect from Granada, Juan Moya Romero, and his collaborators. 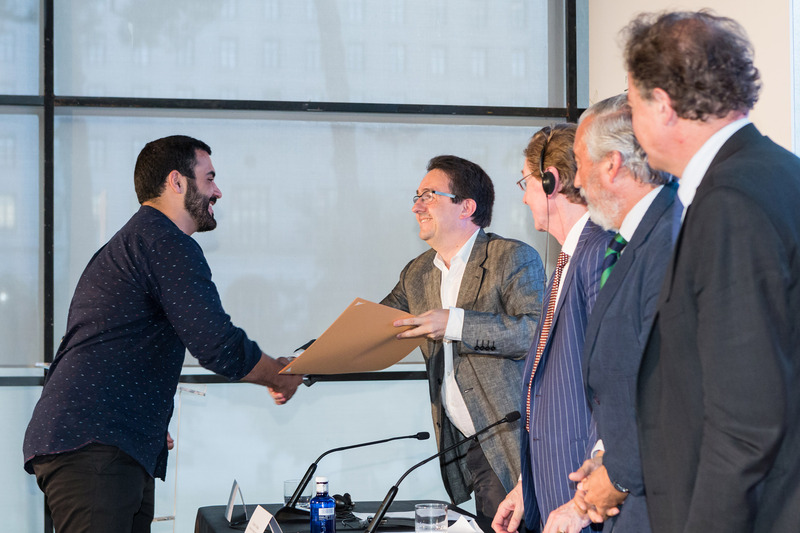 Three honourable mentions were also handed out, each of which was awarded €2,000. 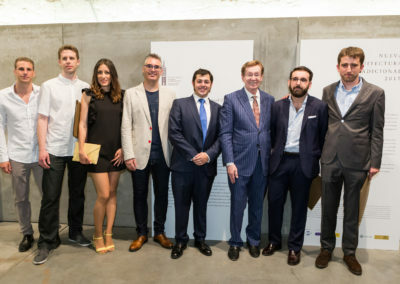 Juan Moya Romero and his collaborators Sara Lobón Ruiz, Luis Tovar Timmerman, Víctor Rejón Terrones y Víctor Manuel Jiménez Sánchez. 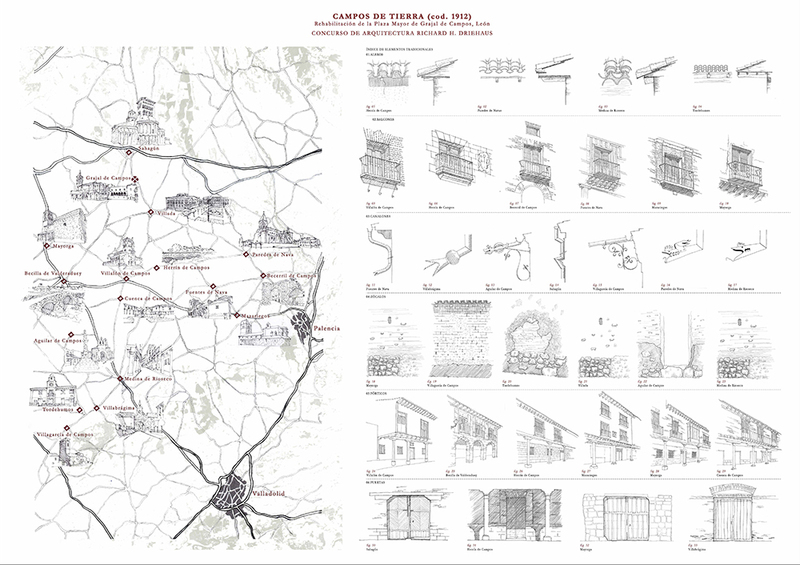 The proposal the jury selected for the €12,000 first prize was entitled “Abriendo a Cal y Canto”, by Granada architect Juan Moya Romero, which he prepared with his collaborators Sara Lobón Ruiz, Luis Tovar Timmerman, Víctor Rejón Terrones and Víctor Manuel Jiménez Sánchez. 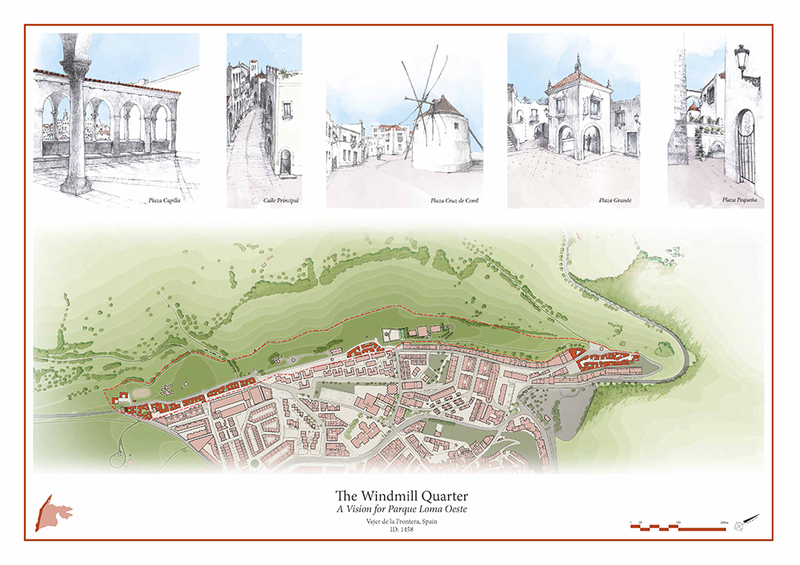 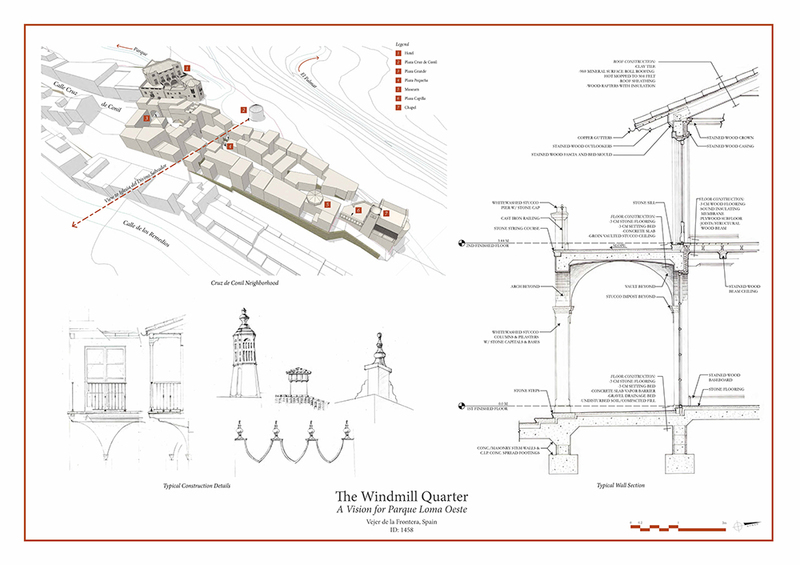 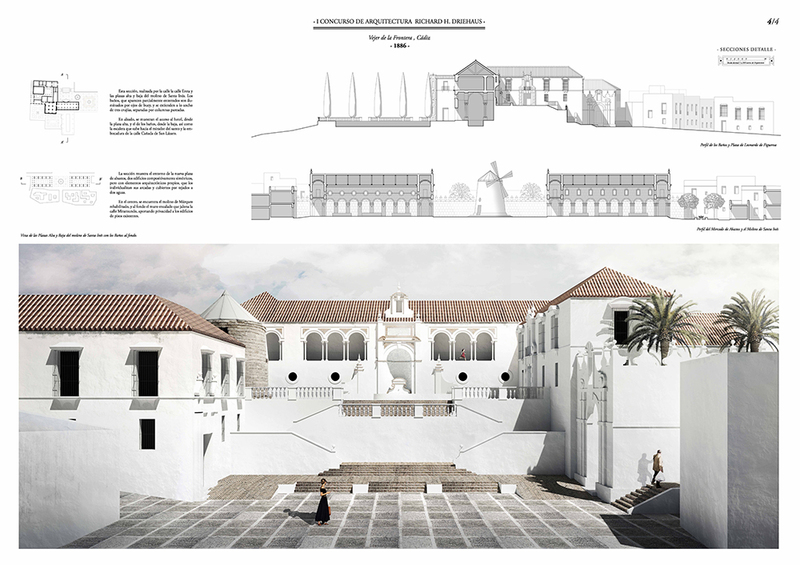 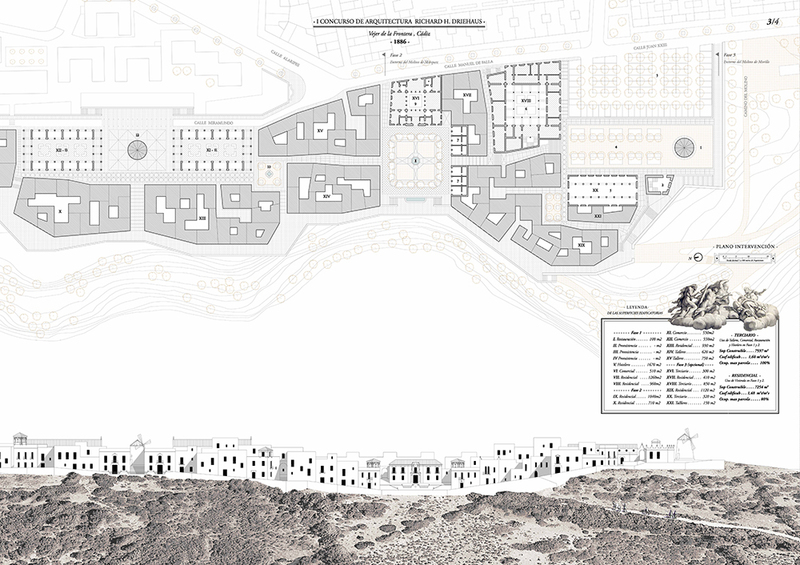 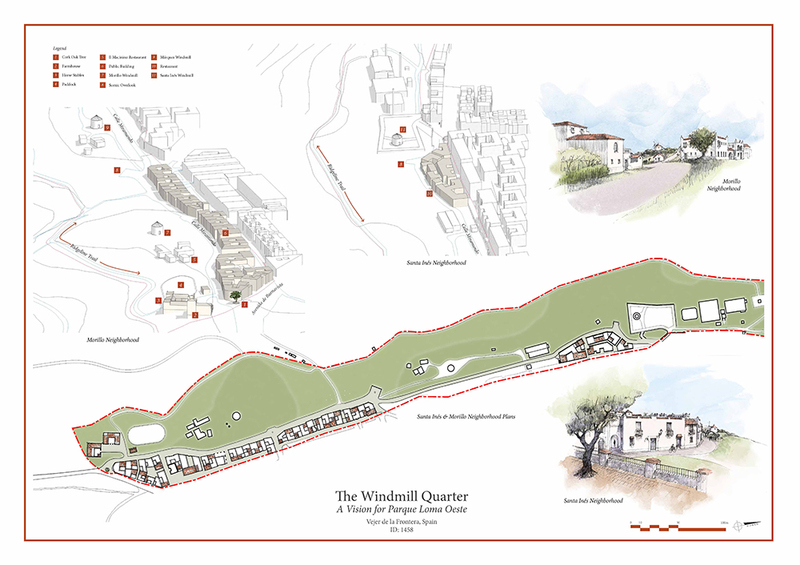 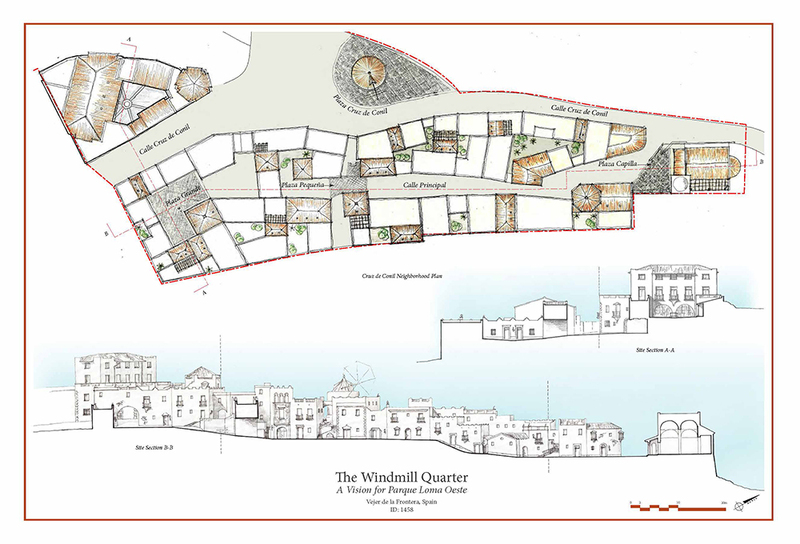 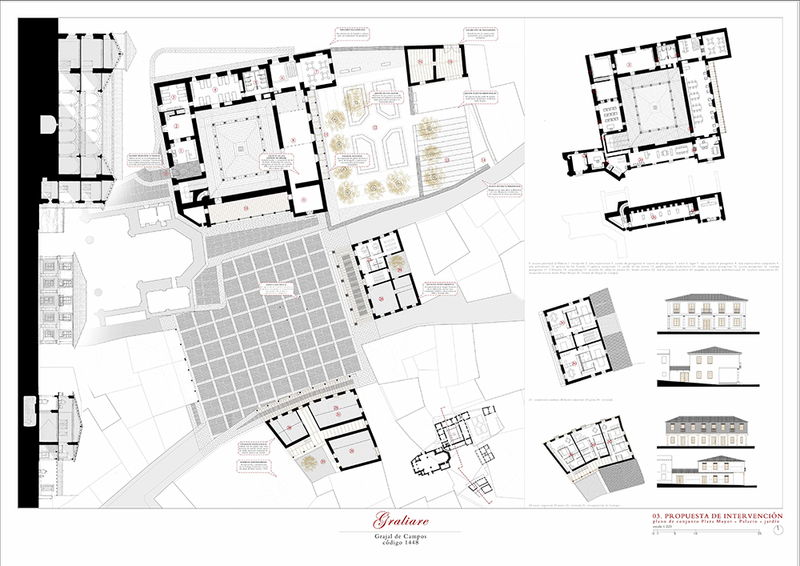 Their design proposed an ensemble which shows the many qualities in the architectural tradition of Vejer: a compact and stepped urban fabric of whitewashed buildings extending organically from the bottoms of the windmills, ensuring that the windmills never lose the role they have held for centuries, always defining the skyline of the town from this side. 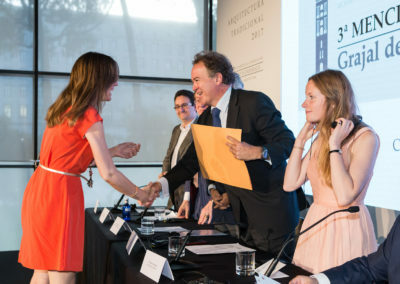 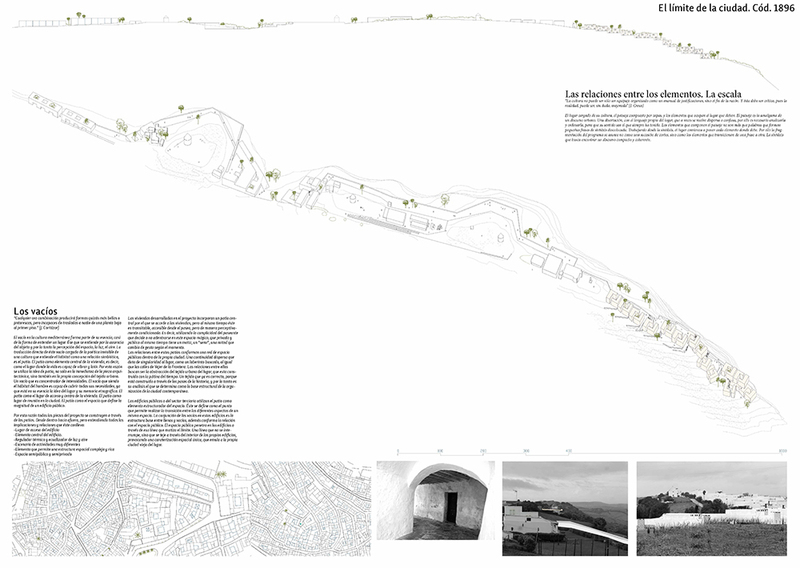 The three honourable mentions the jury awarded, each receiving a €2.000 prize, were handed out to “El jardín de las Hespérides”, by the team of Abelardo Linares del Castillo-Valero and Elena Jiménez Sánchez, who made masterful use of an exuberant local architecture and proposed to create several public squares around the existing windmills; “El límite de la ciudad”, the proposal by Nuria Prieto González, was notable for using a terracing system to mitigate the visual impact the expansion might have; and “The Windmill Quarter”, from the prestigious US architecture office Fairfax & Sammons Architects, showcased the talent of this firm in configuring attractive city blocks with a distinctive local character. 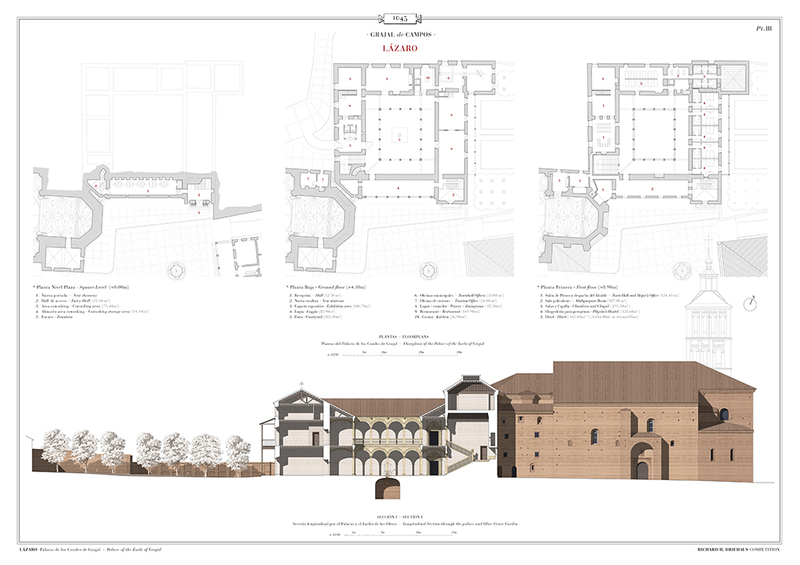 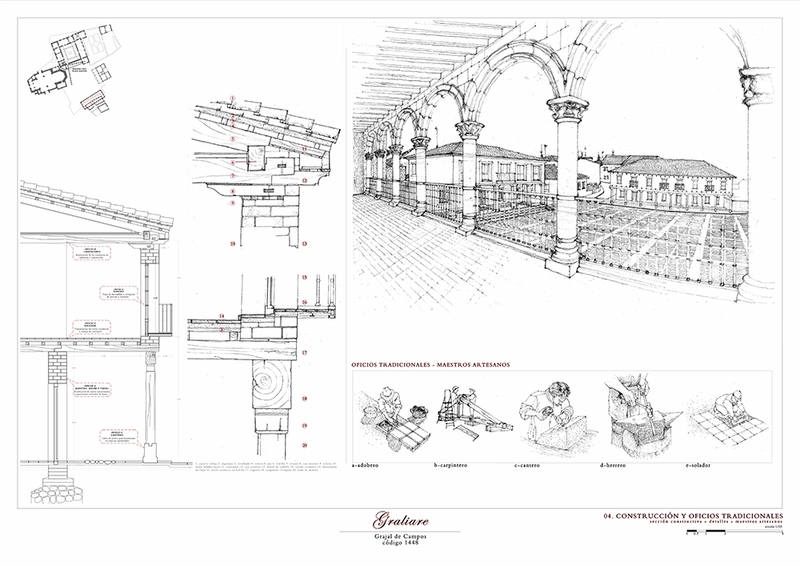 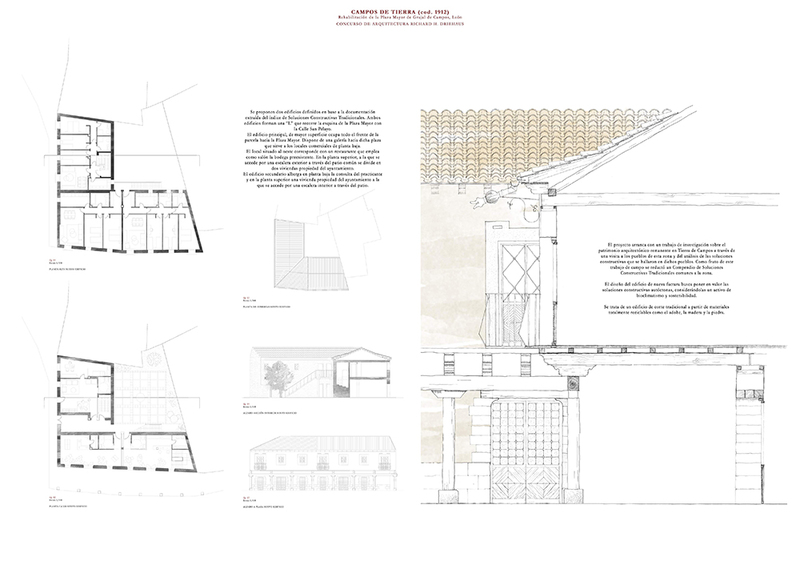 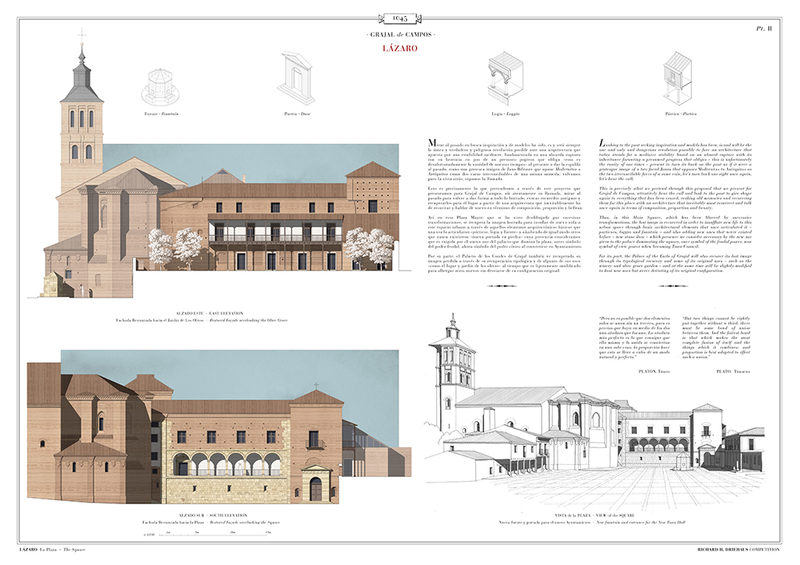 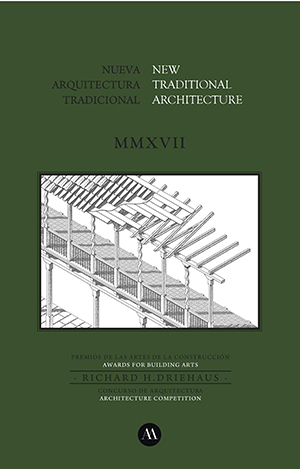 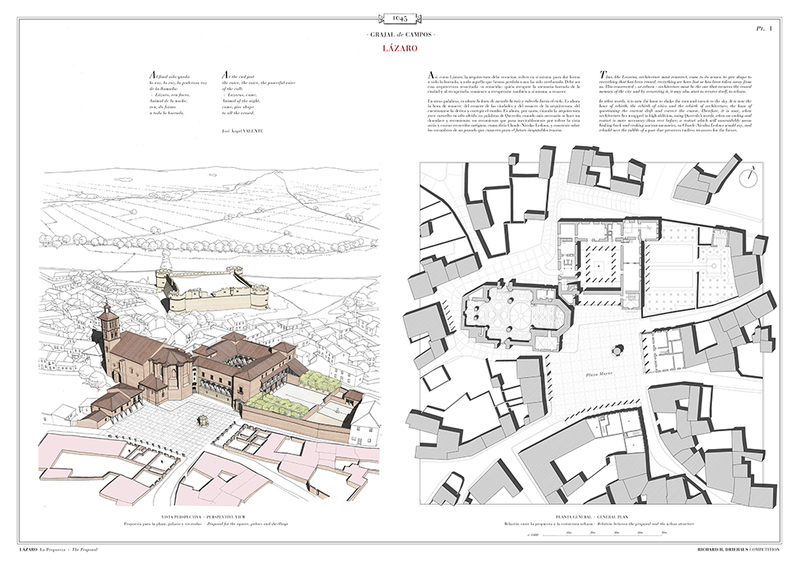 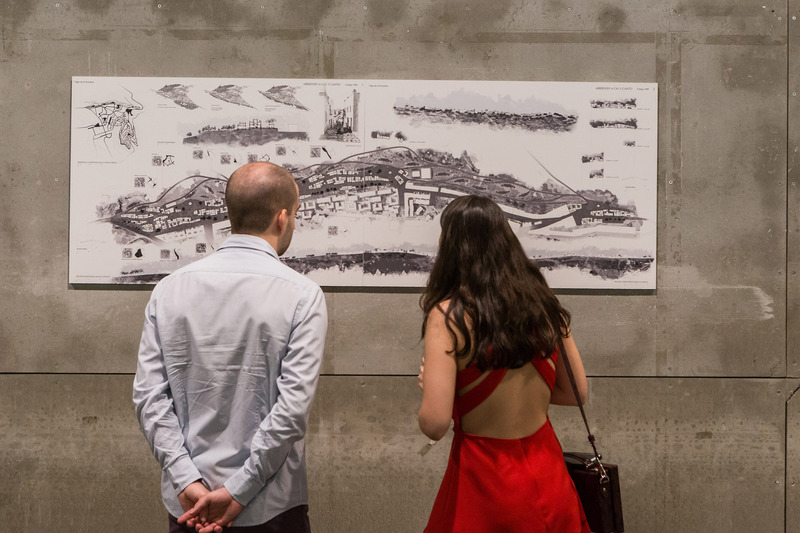 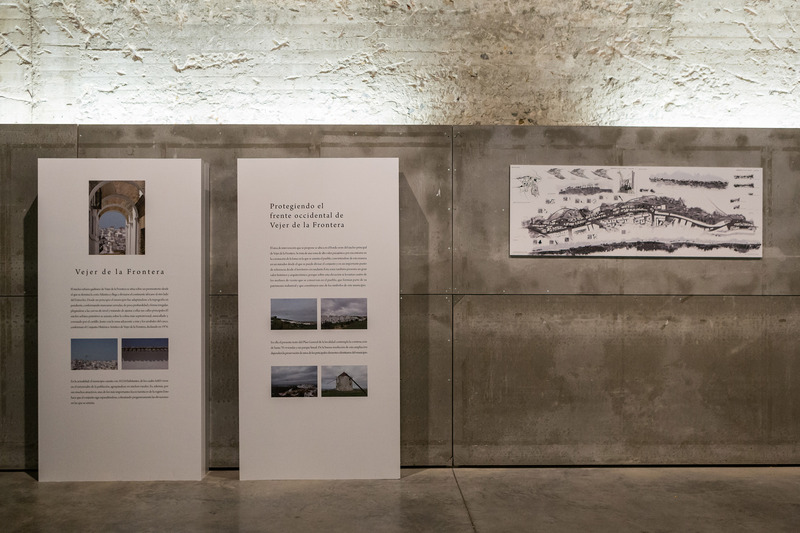 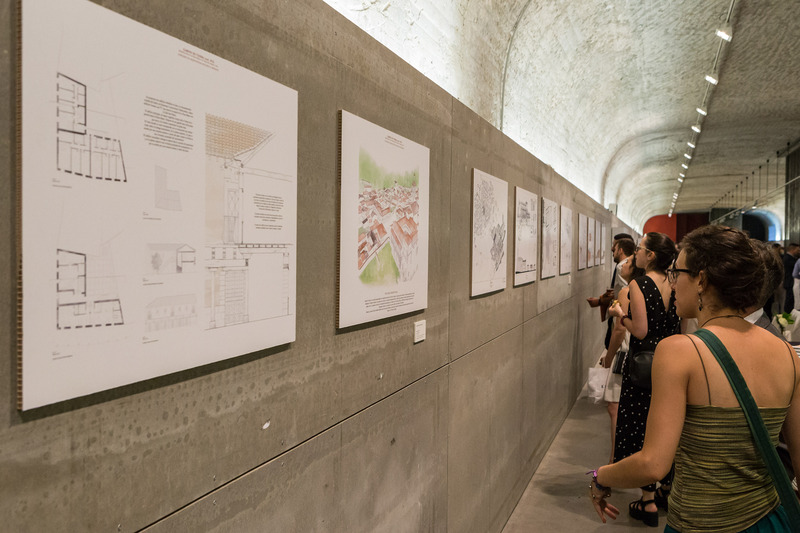 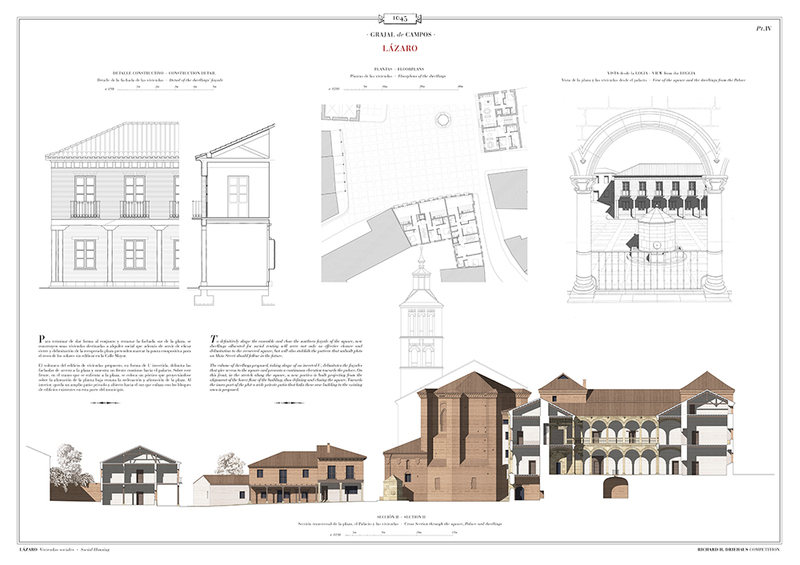 It was published on the occasion of the Richard H. Driehaus Architecture Competition and the Richard H. Driehaus Building Arts Awards 2017 Ceremony, as well as the inauguration of the Traditional New Architecture Exhibition in which were showed the works of the winners in both initiatives from June 14 to July 23, 2017 in the Arquería de los Nuevos Ministerios in Madrid. 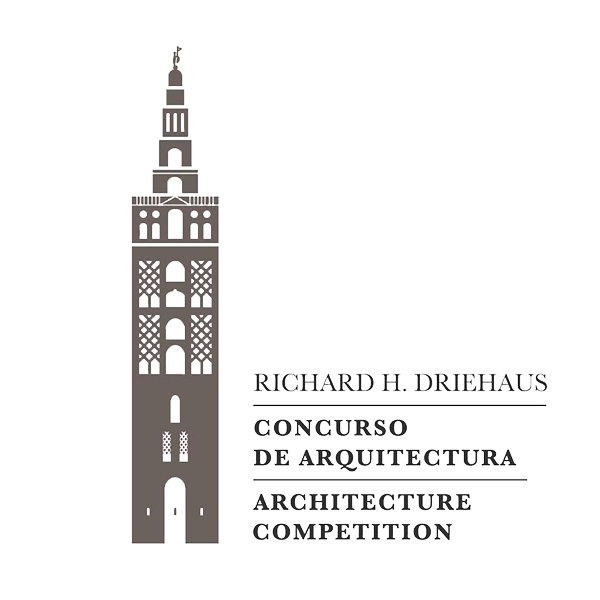 This publication will present the results of the 2017 Richard H. Driehaus Architecture Competition and Richard H. Driehaus Building Arts Awards. 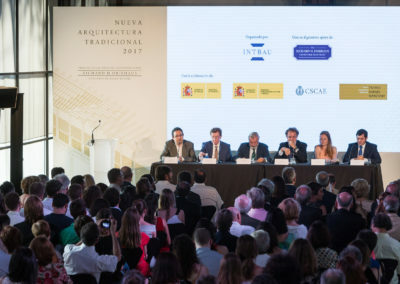 Both competitions are organized by INTBAU (the International Network for Traditional Building, Architecture and Urbanism), thanks to the generous support of the Richard H. Driehaus Charitable Lead Trust, and the collaboration of the Department of Building and Architecture of the Ministry of Public Works and Infrastructure, the Department of Beaux Arts and Cultural Heritage of the Ministry of Education, Culture and Sports, the Rafael Manzano Prize and the Council of Architecture Institutes of Spain. 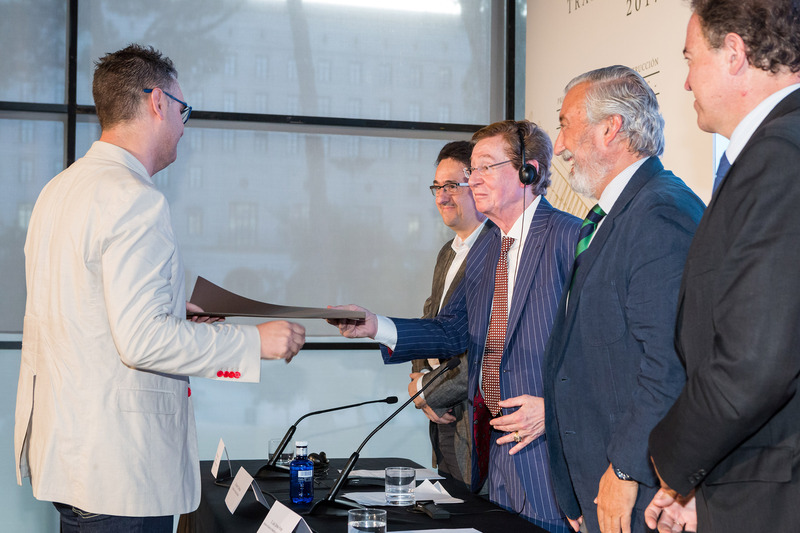 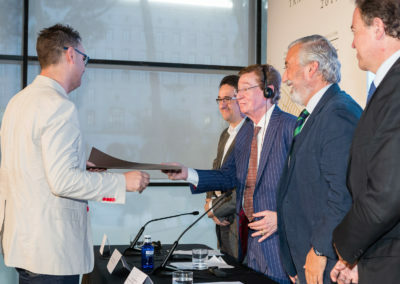 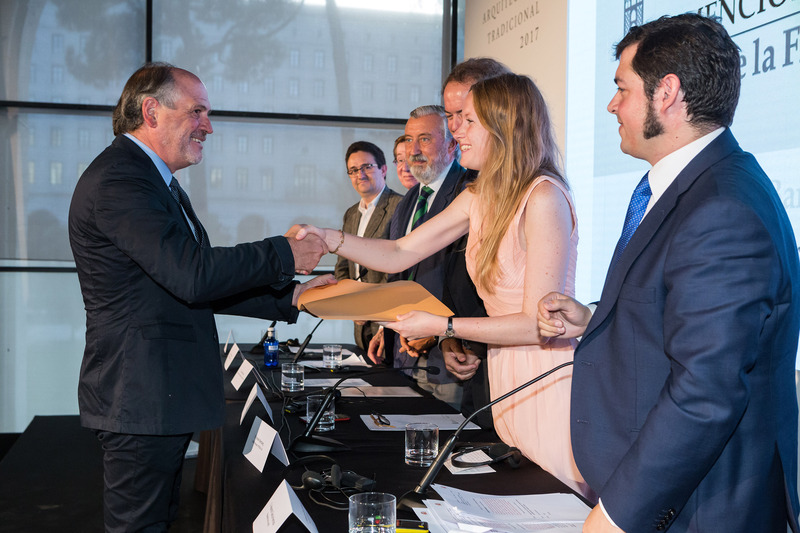 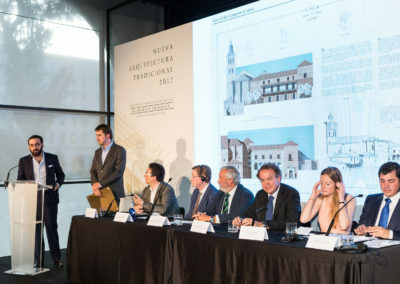 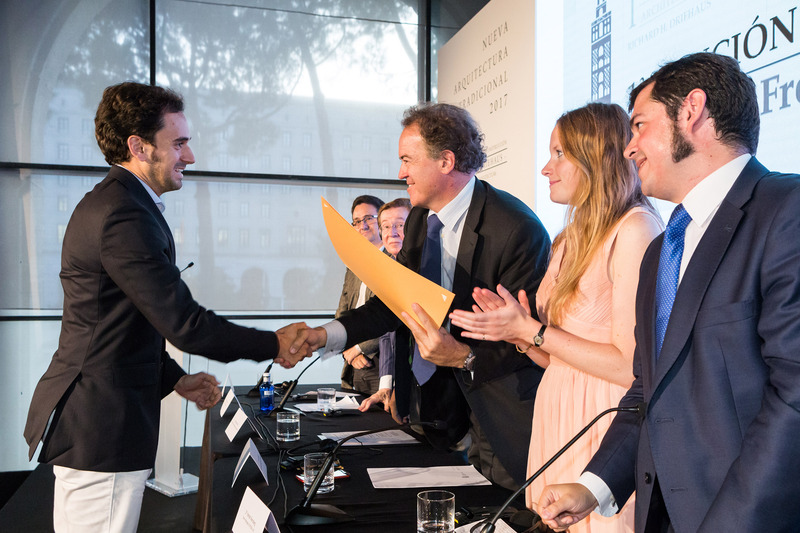 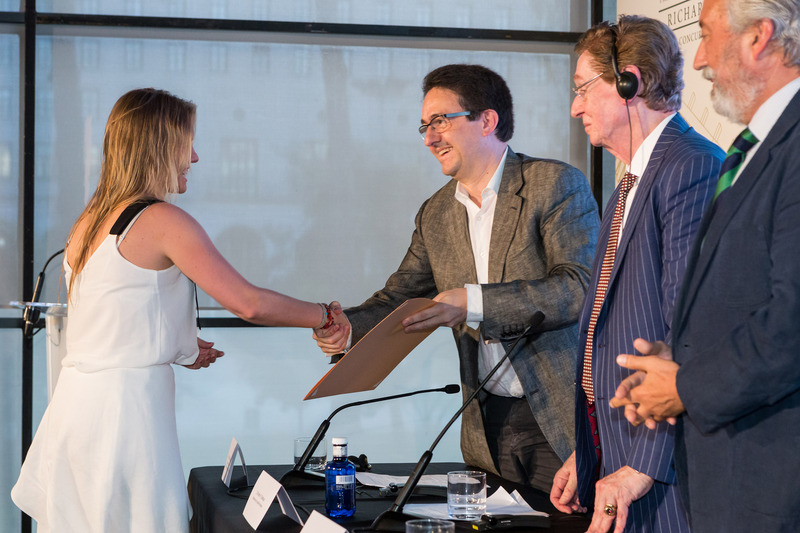 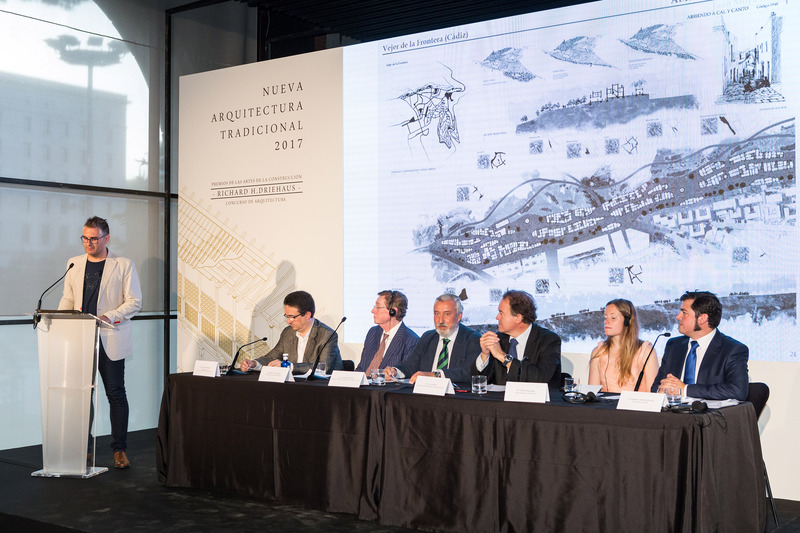 On Wednesday, June 14th, the Richard H. Driehaus Architecture Competition and the Building Arts Awards laureates were presented at the Arquería of Nuevos Ministerios. 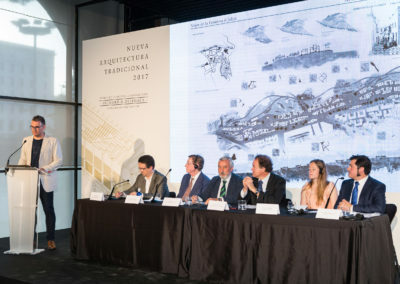 The event was chaired by: Mr. Julio Gómez-Pomar, Secretary of State for Infrastructure, Transport and Housing; Mr. Luis Lafuente, General Director of Fine Arts and Cultural Heritage; Mr. Richard H. Driehaus; Ms. Harriet Wennberg, Senior Manager of INTBAU; Mr. Alfonso Samaniego, Vice-President of the Institute of Architects of Spain; and Mr. Alejandro García Hermida, Coordinator and Chairman of the Jury of both initiatives. 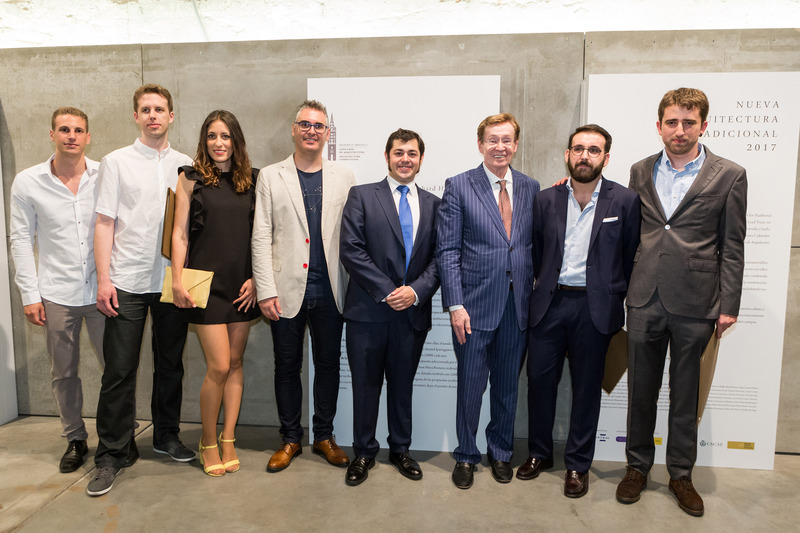 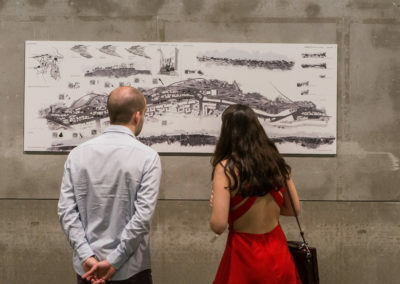 In the same venue was inaugurated the exhibition that will show the works of the winners until July 23rd.